DELMAR — After 20 plus years in construction accounting and having retired from the Navy Reserve, Lance W. Raffe looked for a way to turn his passion for nature, feeding wild birds and attracting wildlife to his backyard into a business. Wildbird Junction Backyard Nature Shoppe is the final result of that search. After years of frustration looking for a quality source of wild bird feeders, bird houses, bird baths and, especially, wild bird seed and seed blends, Raffe was determined to create the store that he wished he could have shopped in during his many years as a backyard wild bird feeding hobbyist. 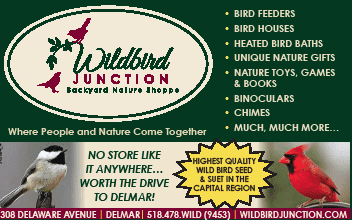 Unlike other wild bird stores, Wildbird Junction also offers a wide selection of nature gifts, garden décor, guide books, nature toys, chimes and a full line of binoculars.